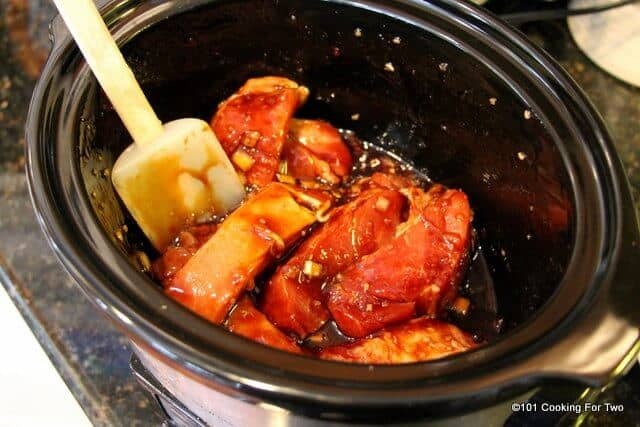 A great Chinese slow cooker dish. 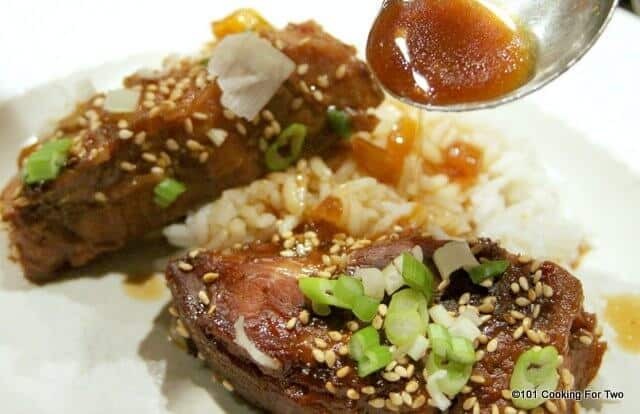 These Sesame Pork Ribs are tender and tasty for that change of pace meal. Who can’t use a Chinese meal? 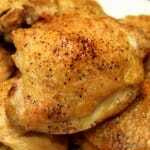 This uses one of my favorite cooking for two meat, country style boneless pork ribs. Based on a Food.com recipe but simplified and cut done for a more reasonable amount. The original was for 5 pounds. Nope, cooking for two here. You get some great taste here for very little work. Serve with rice and wait for the compliments. Notes: An easy recipe to double or triple. We are not big ginger lovers in this house so some may find it a little low on ginger so increase if you love ginger. Start with common ingredients (at least in my kitchen). No special sauces needed. Trim one slab of country style boneless pork ribs. 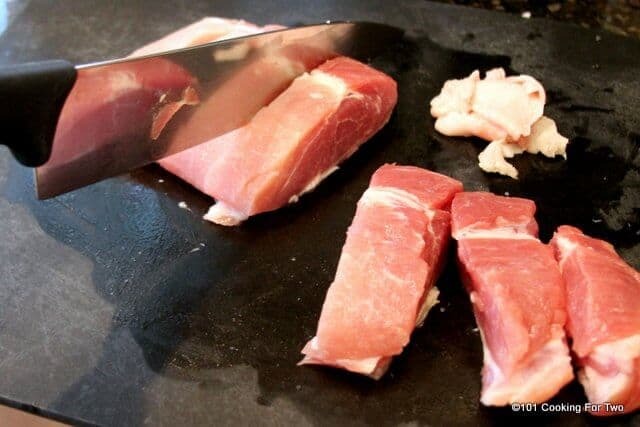 Remove fat cap and cut into pieces following the cuts. Mix in a smaller crock pot (this is 3.5 qt). 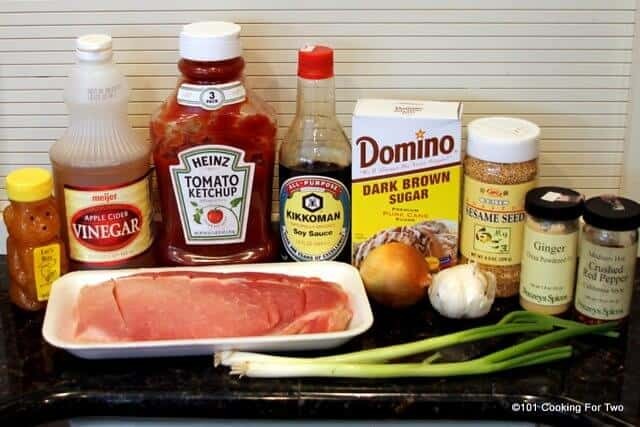 1/4 cup brown sugar, 1/4 cup soy sauce, 1/4 cup ketchup, 2 tbsp honey, one tsp white vinegar, one clove garlic minced, 1/4 tsp ground ginger, 1/2 tsp salt, 1/4 tsp crushed red pepper and 1/2 small onion diced. Mix in the pieces of pork. Cook on low for 5-6 hours. Remove meat and reserve the liquid for “gravy” over the meat and rice. Serve topped with toasted Sesame seed and sliced green onion. 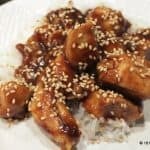 A great Chinese slow cooker dish. 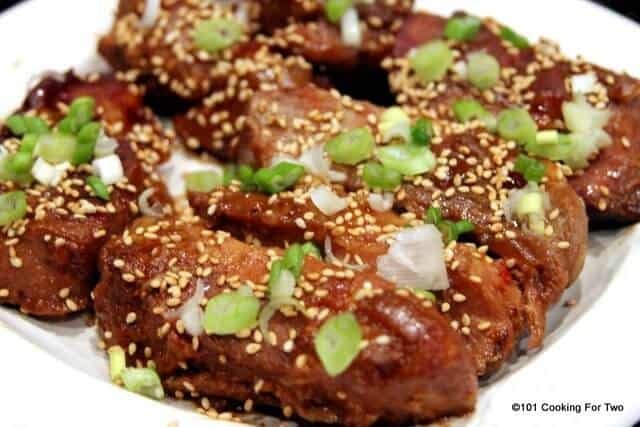 These Sesame Pork Ribs are tender and tasty for that change of pace meal. Who can't use an easy Chinese meal? Mix in the pieces of pork. Cook on low for 5-6 hours. 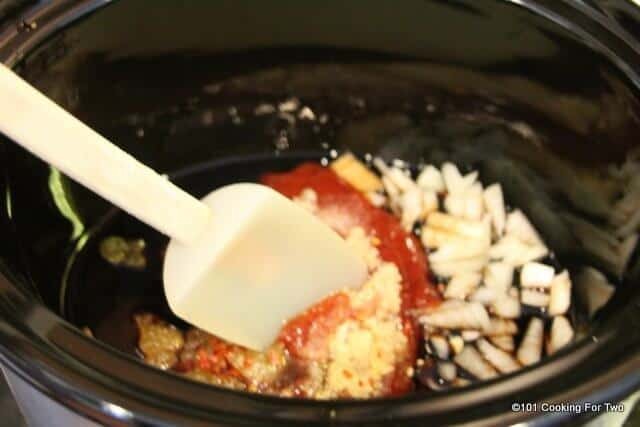 Remove meat and reserve the liquid for "gravy" over the meat and rice. Absolutely delicious! 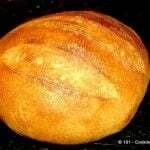 I followed the ingredients exactly as listed, and my husband and I loved it! I neither increased or decreased amounts, nor did I add anything extra. Since I planned on using my casserole crockpot, I mixed all ingredients in a bowl, and then added to the ceramic dish. It seemed a surer way of getting everything blended appropriately and smeared around. After cooking for 6 hours, we sat down and were wonderfully impressed with the mix of flavors. I will definitely do this dish again. The pork tenderloin will cook faster, maybe only 3 hours on low plus or minus (I don’t know). 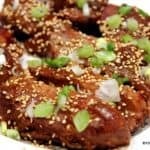 It is much more tender and this recipe does “over cook” the boneless ribs some to make them more tender with the sauce making up for the moisture loss caused by that. So watch it closely for overcooking. 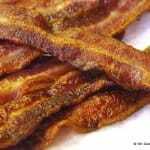 How much is a “slab”of boneless pork ribs? I have a pack that is about 2 lbs. Is that enough? 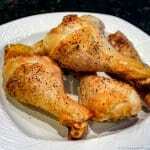 So look at the picture and if not similar, you have the wrong meat for this recipe. So they will be about 3 inches wide, 6 inches long and less than one inch thick. It will all be connected but scored. If you happen to just have a big slab… then go for it. Could I use. Baby Back ribs? I was to lazy to cut the fat off and my ribs were on the bone. I cooked them as directed, delicious. Since the fat ruined the sauce, I’m making a second batch of it to cook down a little on the stove. This recipe is a keeper. Thanks! The bone-in country style ribs are a totally different cut and will always have too much fat for this recipe. The bone-in are a shoulder cut. The boneless are the tail end of a pork loin and very lean. In some areas of the country the boneless are hard to find. I added the last 20 minutes sliced 1 red pepper and 1/2 green pepper also the last 5 minutes cooked broccoli tops. This was so easy and good. I am going to add small can of diced pineapple and see how that turns out. i have a ton of fresh mushrooms I need to use up, would mushrooms be good in this? I really don’t know. We don’t do mushrooms due to family food allergies. I don’t know how they do in a crock pot. If you try it, please past a comment on how it went. Thanks for the comment and the rating. These were really tasty. I got confused by the ingredient list….didn’t have white vinegar so I substituted Apple Cider vinegar, which is what you have pictured. These had a little kick that I didn’t expect (probably from the red pepper). Delicious! I did actually make it with apple cider but one of the recipes I was modelling used white and I did the write up a few days later and didn’t change it. Either should be fine. It’s easy at my house. Neither of us are ginger fans, especially fresh. Just not fans. Stove top I don’t think so. I would think covered in an over about 325-350 for a couple of hours would work… Have not tired it. If you do please post results.